In line with our goal to help your skin be at its best, we’re come up with this list of the top performing bronzers in the market today. After more than 15 hours of hard work, we were able to pick the best bronzer for oily skin based on the products’ ability to give you a sun-kissed glow without the grease and shine. Maybelline Mineral Power Bronzer has pigments that can last for 8 hours on your skin. It's free from fragrance, talc and the other harmful chemicals that can cause problems for your oily skin. If you are looking for a more natural finish, then N.Y.C. New York Color Smooth Skin Bronzer is the right fit for you. It comes in a pressed powder form which means a no-mess application. Just make sure to blend the product well on your skin to avoid ending up with streaks on your cheeks. For added skin benefits, you'll love bareMinerals Bronzer as it has antioxidants. It has a buildable color and leaves a matte finish on the skin. If you dislike looking too orange with your bronzer, we recommend TheBalm Bahama Mama. It comes with a unique packaging which you can easily throw in your bag before heading out. Take note, however, that this may not work for people with really fair skin. It tends to look dark or even dirty when not blended properly. Neutrogena Skin Blends N﻿atural Radiance Bronzer has a matte finish. It's the best product you can invest in if you have fair skin and want to get a sun-kissed look. It leaves a matte finish on the skin that can keep shine and grease away. Now that you know your options for the best bronzer for oily skin, let's get into the details. If there are criteria you need to be on the lookout for when it comes to bronzers for oily skin, then that there are three things I can suggest: oil-free, noncomedogenic and fragrance-free. Maybelline Mineral Power Bronzer can give you exactly these things and more. It has no preservatives and can last 8 hours on your skin. The best thing about is that it’s made from 100% micro minerals. It glides easily on the skin and provides a natural sun-kissed glow- like you’ve just came back from the beach. Its size and packaging makes it a nice option for travelers or for people who like to do quick touch-ups when outdoors. Again, it’s long lasting so I highly doubt if you’ll need to add a few more swipes by midday. If you ever do, you can use the brush it comes with. Take note, however, that the quality of its brush has mixed reactions. If you don’t like risking your look, I suggest you use your own brush instead. The product is pigmented so make sure you start off with a small amount and just add more until you get the right bronzed-look you want. It’s easier to add more color to your face than to make corrections. The bronzer has little shimmer which is a great thing for oily skin. Large glitters and shimmers can make your large pores and oil look more noticeable. N.Y.C. 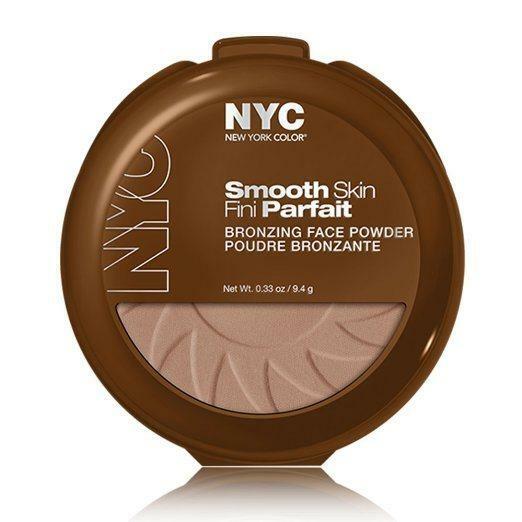 New York Color Smooth Skin Bronzer has a nice pressed powder-like formulation. It even has a sponge that you can use to apply the product on your face. For a more natural finish, however, I suggest you use a separate bronzing brush for this one. It has no scent and shimmer which are exactly the things the best bronzers for oily skin must be. It’s the perfect product to invest in if you dislike the flat look you can get from wearing foundation alone. Aside from being a bronzer, you can also use this product to contour your cheeks and the sides of your nose. It also makes a good eyeshadow if you want to add more depth to your eyes. And the best part of this product is that it’s really affordable. It’s a good dupe to some of the high-end bronzing products on the market today. Packed with its own Sea Nutritive MineralTM Complex Blended, bareMinerals Bronzer can give you more than just a sun-kissed glow. It has a good amount of antioxidants, like cold-pressed carrot oil, to slow down the signs of skin aging and protect your skin against free radical damage. The product has no fragrances, parabens or even synthetic dyes. It has a finely milled texture to give you a true matte finish. And since it’s matte, you can build the color. You can also use it as a contouring powder, depending on how intense you apply the product. You can use a fluffy brush for a more natural look or apply it with a dense brush to intensify the shade on your skin. TheBalm Bahama Mama has a matte finish that’s fit for a bronzer for oily skin. It won’t look orange on your skin despite being highly pigmented. It comes in a really nice packaging. It’s not prone to breakage but can be prone to little dents since it’s made of cardboard. It’s the perfect size and design for traveling. It even comes with a mirror- but no brush- to help you out with application. One thing I find nice about this product is that it’s easy to pick up the pigments and blend it on your skin. You wouldn’t have to go back and forth just to get the intensity you like. In case you’re looking for a bronzed look that won’t sparkle or make you shine, Neutrogena Skin Blends Natural Radiance Bronzer is a highly recommended product. It blends amazingly, without looking too tan or orange. The nice thing about this bronzer is that it looks natural on fair skin. It won’t look too dark or dirty. It comes with a brush but I’d definitely suggest you use one of your own to get a more natural finish. The brush can be a bit hard to use on the skin and can make the product look streaky. It’s noncomedogenic and free from fragrance and oil. It has a sheer color for a natural-looking result. Bronzers are basically used to add a healthy glow to the skin. It’s different from contouring products in that bronzers are applied to mimic the sun’s rays on the skin. Just think about your skin after getting back from the beach. For oily skin, choosing the best bronzer can be tricky. It can take a bit of experimenting to get the right product for your skin type. However, as a general rule, you have to stay away from bronzers that have sparkles and shimmers since they can only accentuate your oily skin and large pores. Your skin’s bestfriend will be bronzers that are in gel, powder and liquid in form. Choose one that is up to two shades darker than your skin tone for a more natural result. Start off with applying a small amount of the product. You can use a tapered brush to build the color on your skin and tap off any excess. Go slow and take the time in getting the shade or intensity you want. Remember, it’s easier to add more color than to reduce the pigments that are already on your skin. Bronzers are supposed to give you a sun-kissed look so it’s a good idea to concentrate on areas where the sun naturally hits the face, such as the bridge of your nose, forehead, apples of the cheeks and the chin. In case you can’t resist using a bronzer that has shimmers, test the product out first under natural lighting so you can get a clear idea of how it will make your skin look. Make sure that it’s not too shiny or, else, it won’t look natural. When you have oily skin, it can be a struggle to keep your makeup last long. Before you know it, your foundation has already worn off and there’s the slightest hint of blush and bronzer on your skin left. Applying moisturizer can help prepare your skin to hold products better. Even oily skin needs some love so make sure not to skip moisturizing your skin before applying any cosmetics. Aside from prepping the skin, you also need a primer. It can make your makeup last longer by decreasing your skin’s oil production. The less oil your skin produces, the longer your makeup will last. Set your makeup with a setting spray. It adds another layer of hydration without affecting the makeup you put on. Finding the right product that can match your skin type is already a tough job on its own. The struggle doubles when you have oily skin. Aside from the usual concerns of breakouts and clogged pores, you may also find it frustrating when your makeup doesn’t seem to stay in place- even just for a few hours. For the best bronzer for oily skin, we’re recommending Maybelline Mineral Power Bronzer. It has a mineral formulation that’s meant to last on your skin for 8 long hours. Without the talc and fragrance, your risk of breaking out with this product is very minimal. It can be quite a mess to use since it’s loose powder, but once you get the hang of it, you’ll find this bronzer a staple in your vanity table.